I've suggested before that The Lord of the Rings by JRR Tolkien is a great way to prepare a young person for a career in biogeography. I would go further and suggest that The Lord of the Rings is a great way to prepare someone for ecology and evolution full stop. I have read the book seven times since my uncle gave me a battered copy in 1979 when I was 12. Growing up in New Zealand meant that the images that I constructed of the LotR landscapes were remarkably similar to that of the movies (although my Shire looked more like the larger rolling hills of South Otago than those of the northern Waikato). I have just read the book again and find it just as enthralling as previously. I also find that as I age, I find different characters and sections of the books more or less compelling than in the past. For example, although younger Adrian enjoyed the travels of Sam and Frodo after the breaking or the fellowship, I used to think it was a little slow. Now I find that I enjoy this part of the books more that the daring-do of what happens to Pippin, Aragorn, Gimli and the rest of the gang. My previous read through was in 2007 and I have since lived through a natural disaster (the Canterbury quakes). Maybe I sympathise more with the personal change and growth that Sam, in particular, goes through in response to the stress and tragedy of his journey. Last time I read the LotR with a biogeographer's eye, noticing the deep history, the landscapes and distributions. This time I read the LotR with more awareness of the ecology, noticing the interactions, the descriptions of habitats, the effects of change, even the climate change effects! One of the things that struck me is that the concept of environment and experience interacting with inherited traits to determine the expression of everything from the plants of the Morgul Vale to how the hobbits put right the Shire when they return. Merry, Pippin, Sam and Frodo are able to rally the Shire on their return to expel Saruman and his occupying forces not because they are genetically superior to other hobbits but because of the experiences that they have been through that have changed their behaviour compared to the rest of the Shire hobbits. "One does not simply walk into Mordor". Unless you are in New Zealand, and then you can even take your kids. Take this passage from when Sam and Frodo finally enter Mordor. "And here things still grew, harsh, twisted, bitter, struggling for life. In the glens of the Morgai on the other side of the valley low scrubby trees lurked and clung, coarse grey grass-tussocks fought with the stones, and withered mosses crawled on them; and everywhere great writhing, tangled brambles sprawled. Some had long stabbing thorns, some hooked barbs that rent like knives. The sullen shrivelled leaves of a past year hung on them, grating and rattling in the sad airs, but their maggot-ridden buds were only just opening. Flies, dun or grey, or black, marked like orcs with a red eye-shaped blotch, buzzed and stung; and above the briar-thickets clouds of hungry midges danced and reeled." This reads like a slightly grimmer version of Darwin's 'tangled bank' paragraph from the Origin and similarly it conveys how life adapts to any situation. A large part of what ecologists and evolutionary biologists do is to look at how populations adapt to changes in the environment. The plants of Mordor have adapted to living in an environment that was once benign to the harshness created by the proximity of a large active volcano and a dark lord. New Zealand, despite what you might see in the LotR movies, is for the most part highly changed from what it once was, although only parts are Mordor-like. Since humans have arrived much of the country has been converted from native vegetation to exotic pasture on which we graze our sheep and dairy cows. 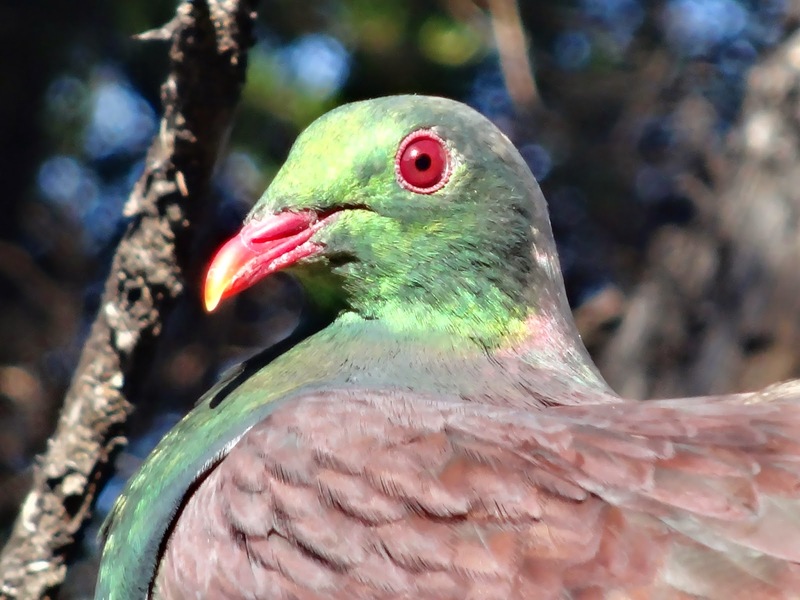 The stories of invasive species establishing in New Zealand are numerous, most sharing a similarly grim ending, usually at the cost of native species and the local environment. One story with a twist is that of the native scarab beetle species, Costelytra zealandica, which has colonized the introduced pastures, causing so much grief that it has earned itself the name New Zealand grass grab and a reputation as a pest species. The larvae of Costelytra zealandica feed on the roots of white clover and ryegrass and is the subject of considerable control efforts. Costelytra zealandica is also found on native vegetation which it often shares with a close relative Costelytra brunneum. Costelytra brunneum, however, is seldom found on introduced pasture species. What makes such a difference between close relatives and when do these preferences form? Marie-Caroline Lefort from the Bio-Protection Centre at Lincoln University, along with several colleagues from Lincoln, Plant and Food and Unitec, set out to find the answers to these questions. In a paper published in PeerJ they report the results from a series of experiments. Marie-Caroline (or MC) collected Costelytra zealandica larvae from both native and introduced vegetation, as well as larvae from Costelytra brunneum from native vegetation, and brought them back to the lab. 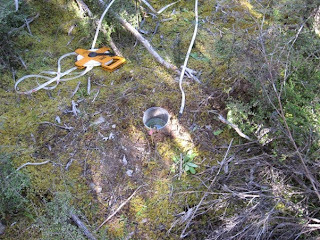 In the first experiment larvae were placed in the centre of a chamber with three exits. The three exits led to either white clover (an introduced host plant), silver tussock (native host plant) or no plant (control) and the choice that the larvae made when exiting the chamber was recorded. In the second experiment the larvae were fed either white clover or silver tussock roots and their weight gain and survival rates over six weeks was recorded. In the choice experiment, larvae from Costelytra zealandica and Costelytra brunneum raised on native plants showed no preference for the types of plants they would move towards. Costelytra zealandica raised on white clover displayed a clear preference for moving towards the clover. In the feeding experiments the larvae from both species raised on native plants showed no difference in survival or weight gain regardless of which roots they were fed. However, Costelytra zealandica raised on clover were 6 times more likely to survive when fed clover roots compared to tussock roots and gained twice as much weight. These results clearly suggest that there are large intra-species differences in Costelytra zealandica and that the early childhood environment that the larva lives in makes a huge difference to how the larva will develop later in life. This flexibility has allowed Costelytra zealandica to expand its host range, increase its evolutionary fitness, and boost its population numbers. Costelytra brunneum on the other hand does not look to have this same flexibility and is mainly restricted to the declining areas of native vegetation. So our invasive native species looks to be a great example of how phenotypic plasticity, allowing childhood experiences to fix how adults will look and behave, can lead to massive advantages. If Sauron had added this variation to his orcs he would have easily conquered Middle Earth. I must keep that in mind next time I read the Lord of the Rings. Come over to the new site and take a look! 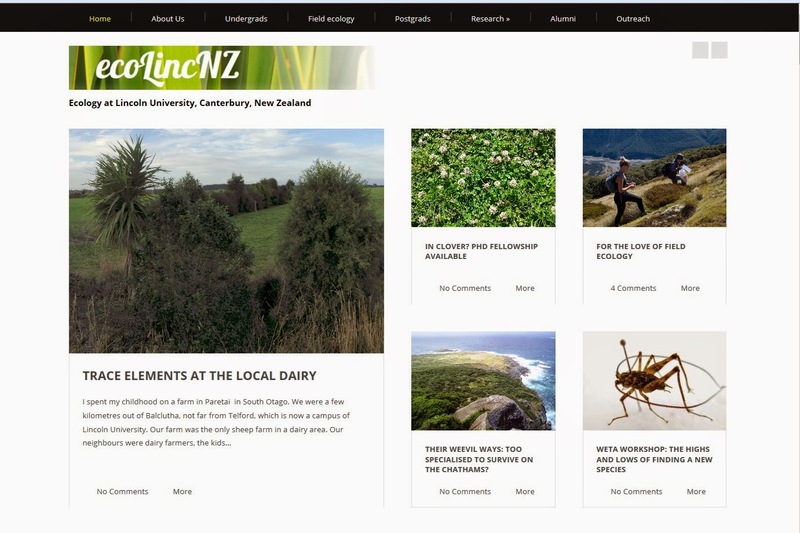 Recently we moved our EcoLincnz blog to a new site. We will look at shutting this site down completely at some point in the nearish future. The new site has a bunch more information about ecology at Lincoln University as well as several new articles. In which we see that direct human impacts are even more important in extablishment of invasive species in mountain areas than climate change. In which we see the impact of grazing on mountain grasslands. Does riparian restoration improve water quality? In which we see how cattle with altitude can coexist with Ecuadorean diversity. Handling redback spiders: keep cool? On the value of bespoke collections: regional natural history collections are important too! Their weevil ways: too specialised to survive on the Chathams? Change has been much on my mind recently. With one son moving into Christchurch to continue with university, another moving to Dunedin to start university and only the third at home for a couple more years (he said hopefully), I have been asked repeatedly about what I will do in the medium term. Down size the house? Maybe look at positions elsewhere? Make a lifestyle change? I'm not sure what motivates these comments as I am happy in my nice, large, old house (it would be great to actually be able to use some of the rooms myself, finally). I enjoy living at Lincoln and working at the University. And I like being an evolutionary biologist. However, on Darwin Day 2015, let me consider my options. If I was to look for another evolutionary biologist position (especially one that focused on biogeography or coevolution) my options would be fairly limited. Within New Zealand there are about seven other similar positions at universities, maybe about the same again in Crown Research Institutes. In the 20 years that I have been at Lincoln I can remember evolutionary biologist jobs coming up about three times. So it would be very difficult to move within New Zealand. Should I want to go overseas then there are definitely more jobs, but not a whole lot more (and there is a lot of competition!). So I am reasonably tied to Lincoln. Why? Because I am so specialised. 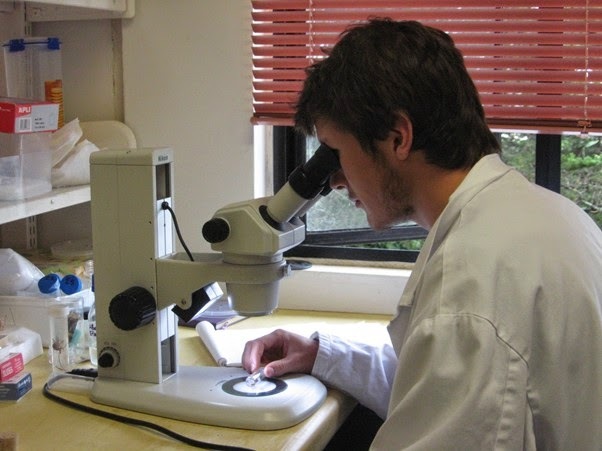 To do my job I need a research environment, access to postgraduate students, funding, an organisation that values evolution research and so on. Specialisation, while allowing me to be successful in what I do, has effectively limited my dispersal ability (providing I want to stay being an active evolutionary biologist). Similar thoughts abound in biology about specialisation. The idea is that specialisation allows a species to do really well as it efficiently utilises a niche but, come a crisis like climate change or a new predator, specialisation will hinder fast adaptation for change for the species and generalists will win out in these situations. So specialists are successful during stable periods but generalists do better in unstable periods, or so theory suggests. It is also thought that species can become so specialised that there is no way back to being a generalist. This has been summarised as Dollo's Law which states that evolution is not reversible. While we know of many examples where evolution does reverse (descendent species becoming more like distant ancestors rather than recent ancestors) specialisation does seem to make such reversals more difficult. For example, parasitism is often portrayed as a dead-end in evolution. Many parasites lose all sorts of traits, such as limbs, complex digestive systems, sense organs and so on, mostly because they live in their food. Once you have lost or substantially changed these traits then it is incredibly difficult to return to a nonparasitic way of life (but not impossible as Rob Cruickshank and I showed for mites a few years ago). Two coxella weevils getting acquainted. For most species this issue, while interesting to evolutionary biologists, is not a real day-to-day concern. However, for threatened species this problem of specialisation can influence the likely fate of the species. If a species is too specialised then it may be too difficult to find a solution that will allow the species to be conserved. If you need to live in a certain type of habitat, say peat wetland, and this habitat is limited or disappearing, then you have a problem. If you need to eat a certain type of food, say a particular type of honey dew, and the insect that produces the dew is limited or disappearing, then you have a problem. 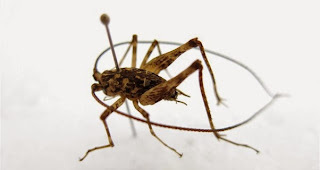 Emily Fountain, with Jagoba Malumbres-Olarte, Rob Cruickshank and myself, have investigated this problem in a threatened weevil species, the coxella weevil (Hadramphus spinipennis). This weevil species is found in the Chatham Island group, an isolated archipelago 800km east of mainland New Zealand. The coxella weevil is now found on two small islands, Mangere and Rangatira, which are 15 kms apart. The weevil lives on, and eats, one plant species, Dieffenbach’s speargrass (Aciphylla dieffenbachii). The coxella weevil was once found over the whole Chatham archipelago but now persists on these two small islands in small clumps of speargrass. The speargrass is extremely patchy and this is not helped by the weevils who will graze out patches of a plant before moving to a new patch. Both islands were once over-run with livestock (which found the speargrass tasty) and since their removal there has been much planting of native forest trees and natural regeneration, which removes suitable habitat for the speargrass to grow in. So the coxella fate seems tied to the plant that they have specialised on which must make them susceptable to extinction. Emily and Jagoba surveyed the populations of coxella weevil and speargrass on Mangere and Rangitira. She collected a tarsus off the end of one leg from each weevil that she found and was able to extract DNA from these individuals. Emily, in a paper published in PeerJ, found that there was a small difference between the weevil populations on each island, what you might expect if they had been isolated for a relatively short amount of time (around 1000 years). Despite the differences, this indicates that even these specialised weevils can disperse over water, at least occasionally. There was a lack of genetic diversity which suggests that the weevil populations have been through a bottleneck. There was even some evidence that the coxella weevil is sometimes found on other plant species, although whether they are foraging or not could not be determined. On the upside, populations of weevils and speargrass have not declined as a result of the reforestation efforts at this point. So is specialisation a problem for the survival of the coxella weevil? It's fair to say that specialisation on speargrass will not help with conservation efforts, but so far it does not appear to have consigned this species to extinction just yet. After all, it's still easier for a coxella weevil to find a new speargrass plant than it is for an evolutionary biologist to find an evolutionary biology job!